This is a wonderful spelling bee game. This game is great for testing your memory for the spellings of difficult words. Not a bad way to increase your vocabulary, either! To begin, click the Medium link under the picture at left. This opens the game in a pop-up window. 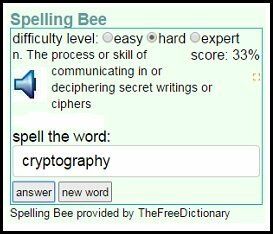 In a spelling bee competition, the announcer reads each word out loud, and the competitors then spell the word out loud letter by letter. In this game, you click the "Play" button to hear the word. Type the word into the "Spell the word" box and click the "answer" to see if you spelled the word correctly. HOW TO PLAY. First, turn on your speakers. Next, click the Easy, Hard, or Expert radio button at the top to select the difficulty of the words. Click the orange Play button to hear the first word. Then, type the word in the Spell the Word box. Click the Answer button to see whether you spelled the word right. The Score section on the right side of the game automatically keeps track of the percentage of words you spelled correctly. If you know an English teacher, point out this game to them. This could be a fun and easy way for their students to practice their spelling and expand their English vocabulary. Game distributed TheFreeDictionary.com. Used with Permission.